It originated at the Alberta Horticulture Research Centre, Brooks, Alberta, selected and tested as BA #44, and released in 1980. The tree is vigorous, upright rounded, with somewhat pendulous branching and annually productive. It is hardy to zone 2a and moderately resistant to fire blight. 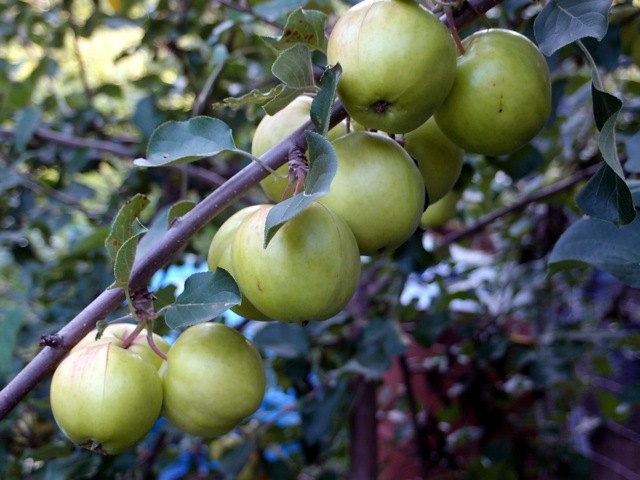 The fruit is medium size, 6.0-7.0 cm (2.5 - 2.75") in diameter, round, with a wide abrupt often wrinkled basin and small core, and matures in late August to early September. The skin is thin, greenish yellow base, overlaid with red stripes. The flesh is cream coloured, moderately coarse, crisp, juicy, slightly acid but sweet and highly susceptible to water core. It is fair to good for fresh eating, good for cooking and stores well for about 4 weeks. Note: This cultivar is quite susceptible to water core.